Photo of the I-90 Vantage Bridge lane edge taken from a car windshield, 2003. Ledge is barely wide enough to ride on and one's panniers can often bump the side. Then there is the tiny piece of roadway between fog line and ledge. 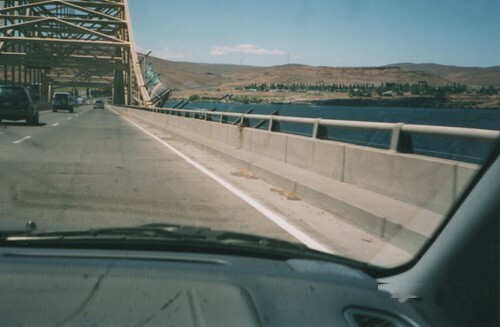 I-90 crosses the Columbia River at Vantage, Washington. Its good shoulder gives way, on the "steel span" portion of the bridge, to a narrow concrete platform. This narrow lip is raised above the lane edge on each side. It was barely enough space to ride on with out bumping into the guardrail, or falling off the curb into the edge of the lane. Gale force winds often blow across this bridge. It can be scary, but doable. I was glad to get to the west section where the shoulder comes back the time I tried it in 2001. That part is on a rock causeway. Both I-90 and the Old Vantage Highway head west through the Saddle Mountains to Ellensburg. This is one of Washington State's driest areas. Also very windy and this day was worse than normal. Climbing the pass wasn't too bad, but those last few miles, across flat lands into Ellensburg, took much of the day. Gale force wind was blowing in my face. I got to town just in time for the bike shop to close its door for the day. An hour, or so later against the wind, I made it to the west side of town to a KOA for the night. Ellensburg, and its Kittitas Valley is much better headed east, rather than west against the wind. I've gone east in that area more often.